What was once a story for children is now the only chance of survival. 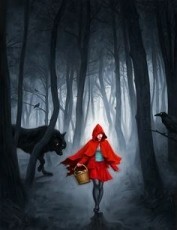 Little Red ran across the floor of the forest, snapping twigs and branches beneath her ruby slippers with each step. Keeping track of the sun’s trajectory in the sky was just as important as getting away from whatever was chasing her. Ragged clothing, spiked teeth, ears tilted towards the sky, all on top of one hell of a mound of terrifying fur; that was what was chasing her. The wolf, who had always had it out for her, even in her early years, was right behind her. Even when her crimson hood was only a scarf, the wolf watched. His yellow eyes burning with a wistful longing have torn into her soul since the day of her birth. No, she thought, Granny told me otherwise. I mean something. Not only to her but to the world. Red’s Grandmother was there for her when her mother was not. Her father was never there, never existent. He left Red’s mom after the birth, and her mom just couldn’t handle the stress of it all. Despite those horrid, falsely appealing retellings of Red’s story that the girl despised so much, her mother never sent her to Grandmother’s house. Red lived alone, traveled alone, and went to Grandma’s alone. The trees grew dim and dank, shutting the setting sun off from the rest of the world. As dawn turned to dusk, light to dark, Red’s hopes seemed to be running slim. Loose branches tug and gnawed at her overcoat, slowing her down, bringing her closer to the claws of the wolf. The house was in sight now. Her Grandmother’s house was a place of refuge. That was the only truth in the fairytales, the only glimmer of all things good that Red had going for her. Her Grandmother provided a future for Red and urged her to continue to grow and learn. Red considered her Granny to be her idol, as she was the only authority in her life. Red nearly tripped when she saw the red brick house, its white, painted windows, its stout little chimney; all the pieces she knew and loved were still there, and so was the safety that came with those pieces. Making one final dash, Red flew through the piles of leaves resting on the ground, allowing the light from the moon to illuminate her hood through the now airborne foliage. The wolf scraped and scribbled against the wooden door as Red slammed it shut into its face. “Granny,” she called, “I’ve made it.” Panting, Red slouched and slid down the wall that held the coat rack. Relief flooded her limbs. She didn’t bother hanging her hood; the carpeted floor was as good a place as any. The grunting and scratching seemed to have stopped as a bellowing wind was heard blowing through the open kitchen window. Where could she have run off to, Red thought. Her Grandmother seemed to be out. Outside the door of the house that Red thought was safe came a familiar voice. Red’s eyes grew wide, her world now crumbling down at the seams, the thread once used to hold her life together now dissolved down into the crumbs of a beggar’s bread. Ah, what an interesting twist on an old fairy tale, Hanorbi! You evoke such strong memory in your prose, too, as always. Thank you, Jack! Glad I'm still able to evoke something in you. I kinda liked scribbled... I might keep it. It's more figurative than scrabbled, which is much clearer. I like the ideas of the claw marks creating doodles on the wooden door. Grandma's got some mighty chompers. The new dentures must've come in. Thanks, Tom! This a great parody of the fairy tale and another departure for you as a writer. I believe it is good and healthy to constantly try new things. This is god entertainment. Well done! Thank you, Chris! As always, I appreciate the kind words. I like that there's some history between Red and the wolf; a vendetta rather than some random attack. It adds flavour. The backstory of the character is fantastic! I love these darker twists on classic fairytales. Plus, it adds so much more depth to the story. I do believe you have an unfinished sentence near the end of your story. When Red is running to the house, the last sentence of the paragraph is: "Making one final dash, Red flew through the piles of leaves resting on the ground, allowing the light from the moon to illuminate her hood through the now airborne..." - it's the seventh-last paragraph. I was wondering if Granny might be the wolf, and although you have not confirmed it, I feel nearly correct in believing so. Beautiful metaphor: "...the thread once used to hold her life together now dissolved down into the crumbs of a beggar's bread." Great story! You brought to life this familiar tale in a fresh way. How in the hell... I think what ended up happening was me revising, changing that sentence, and then not finding the right words and leaving it unfinished. In my head, I probably said 'I'll go back to it later', but I never did. Thank you for being the one to point that out! You are absolutely correct in that assumption. I wanted to make it clear enough without directly saying it. I too loved that metaphor. I know I've mentioned how much I like your writing before, but it really has a bite to it (no pun intended). You transport us to your stories and make us follow every step of the way with the story unfolding beautifully and the tension building; your stories really are art. I like how you portrayed Red as this wandering soul almost trapped in an eternity of her journey to Grandma's, alone until she gets there. I like the depth to the story, the background of her parents etc. Anyway, the only mistake I found was you used 'it's' instead of 'its'. Great take on a fairytale, great impending doom, fantastically written, as per. Good job. Gah, I thought the werewolf grandma was a sufficient twist! Calling my stories art makes me feel accomplished and glad that I decided to take up writing... Haven't even been writing for a year and the success I've had has been incredible. Little pieces of me are left in all of my stories, with this one being no different. Red resembles me in more ways than one. This page was created in 1.3078 seconds.